Choose Privacy Week's theme, "Inclusive Privacy: Closing the Gap," draws attention to the privacy inequities imposed on vulnerable and historically underrepresented populations. 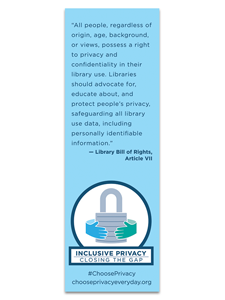 These buttons are perfect giveaways during Choose Privacy Week (May 1-7) and a visual representation of the actions libraries and patrons can take for equal, open, and inclusive privacy. The back of the buttons list a link to chooseprivacyeveryday.org, a resource-rich ALA website stocked with videos, guidelines, tools, and checklists for patrons and librarians alike.